There is, I notice, something pleasing to us wot likes our maffs about the number of coffee shops that we've covered in various places. For Woodbridge, where this all started, we have around 25 on the list, whereas Ipswich has nudged past the 100 mark. That little market town of Framlingham is showing just 5 at present, leaving good old Felixstowe with approximately 50. Those, I put it to you, are nice numbers. Good to return to the heart of our favourite nearby coastal town. Not Walton, not Old Felixstowe, but the centre ville itself. To be totally truthful, if you think of Hamilton Road as Broadway, then this is Off Broadway. It seems like only last month since we visited Comptons on this very spot. Actually that was seven long years ago when we could still get up out of a chair without making involuntary noises. 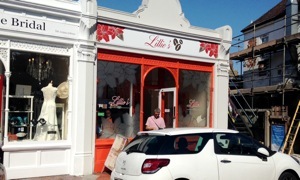 Exit Comptons, enter Lillie's around three months ago with that troublesome apostrophe. That slightly tarty paintwork is clearly bringing in the punters since all four groovily shaped tables, rounded with corner chairs, are occupied. Since it's 2015, we can legitimately share with that singleton lady: pardon us, madame. Menu lists breakfasts up to 11:30am (about 90 minutes ago), sarnies, paninis and omlettes (sic), plus a bunch of hot meals such as sausage and mash, lasagne, etc. Gammon and chips captures Andy's eye. I'm playing safe with a chilli jacket. And sorry, yes, we are on a bit of a deadline, TBH. Our straight down the line grub does the job and it's hoorah for a chilled Dr Pepper. Coffee is courtesy of Paddy & Scott but has to be consumed in a takeaway cup due to us being essential workers. My highlight was the fine slab of severely underpriced rocky road to go, greedily and covertly enjoyed back in the office. Nom. Still not sure about that apostrophe. If it was a car -- Nissan Juke. If they were passing by -- Lily Collins.